HPUD president Darren Cardwell stands in front of a window onto the HPUD headquarters' green roof. 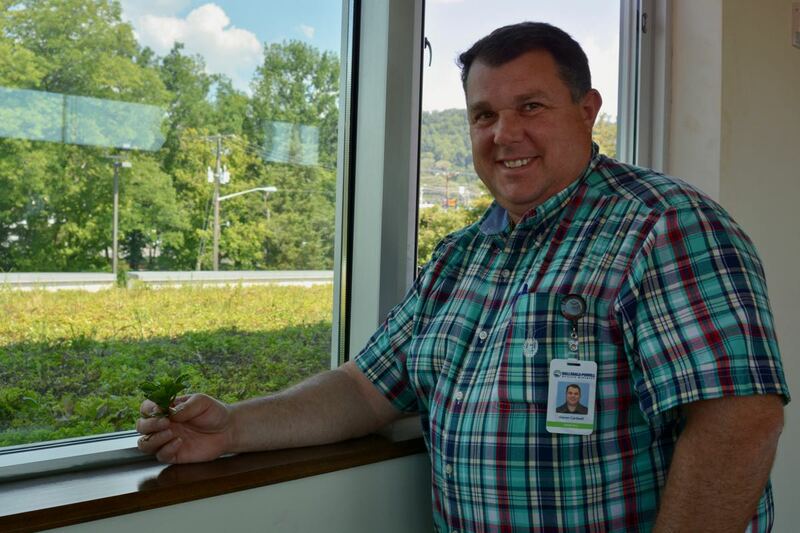 Drivers on Cunningham Road near Hallsdale Powell Utility District’s headquarters may have seen some impressive growth on top of the building this summer. But never fear, that’s just the green roof showing its true colors. HPUD president Darren Cardwell said the green, or vegetative, roof was installed when the headquarters was built back in 2010 with the aim of soaking up some of the stormwater that hits the roof, filtering it and slowing it down before it goes into the local watershed. It also helps with insulating the building. It’s not supposed to get so tall, though. The shallow soil is mostly populated with low-growing sedum plants, but wind and birds bring seeds from other sources, so the roof requires some maintenance. But it’s also served as a demonstration roof for folks thinking about adding green roofs to their own facilities. In fact, Cardwell said visitors from several utilities have toured the building to get ideas for their own headquarters. Aflac the greeter duck finds a shady spot at Hallsdale Powell Utility District. 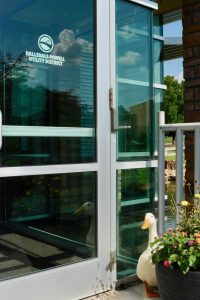 Other stormwater infrastructure items, particularly the rain gardens and bioretention ponds around the headquarters, have attracted a brand-new HPUD team member, the front door greeter duck affectionately named Aflac. According to Cardwell, the duck “showed up” last December and hasn’t shown any inclination to leave. That might be because HPUD staffers feed him … or maybe he’s waiting to make it big in utility management. On a serious note, Cardwell said things have calmed down for HPUD since widespread public outcry against rate increases a few years back. 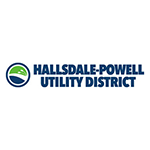 He and the HPUD staff have made an effort to educate the public about what the utility does with their money. He’s hosting an HPUD citizens academy twice a year, inviting folks in for lunch-and-learn, plus tours of HPUD facilities. Staff training is also a factor, with a focus on customer service for the front office staff and field crews. “We know that rates are not what people would like them to be, but we try to give everybody good service for what they’re paying for,” Cardwell said. With Commissioner Bob Crye’s term almost up, HPUD’s board just finished taking applications to fill that seat. The three recommendations they sent to Knox County Mayor Tim Burchett for approval are Crye, Matthew Paul Peters of Knoxville Police Department, and Gerald W. McGee, a former alderman for Town of Arlington in West Tennessee. Projects right now include relocating sewer lines where Emory Road meets Thompson School Road and Fairvew Road in preparation for TDOT work on the intersection, replacing water lines at Bell’s Campground, and the beginnings of a $4 million sewer rehabilitation project scattered all over the district. Also on the books is a project that Cardwell calls, “one of the largest pipeline projects Hallsdale Powell has ever done,” upsizing the sewer interceptor at the Beaver Creek wastewater plant. HPUD is in the process of getting the right-of-way for that project.